The week of May 29th was very busy for JLO Magic & Entertainment. 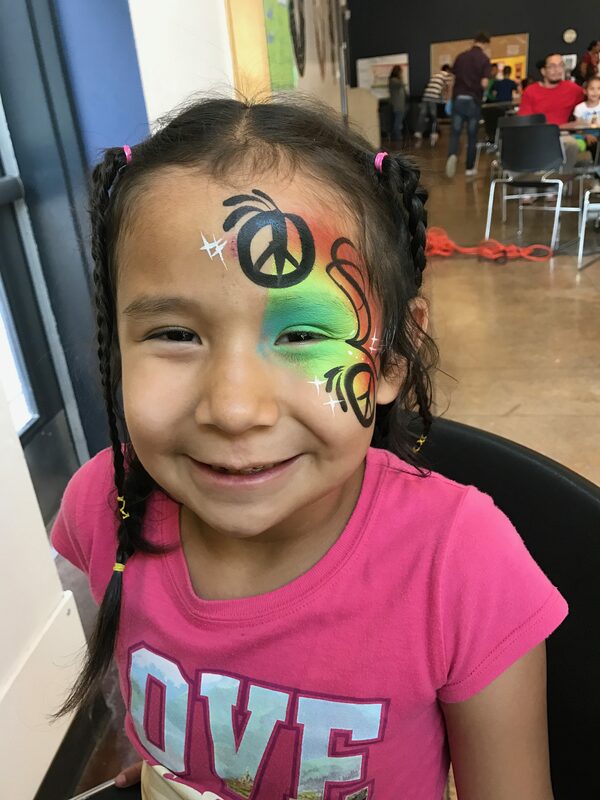 June 1st we did some face painting, airbrush tattoos, and balloon twisting for Cheif Leschi Schools for their end of the school year event. This little darling was so adorable in her peace sign face paint. Unfortunately, all of the other gigs we did that week were so busy, we didn’t have time to take any other photos. Many thanks to Kathryn Yates for pulling this event together. It went so smoothly! June 2nd was our second end of the school year carnival at Crescent Heights Elementary in Tacoma. We did some very, VERY fast balloon twisting as there were hundreds of kids that wanted a balloon. We also had to do some quick airbrush tattoos. It all turned out great and we had a fun time! Thank you, Kimberly, for hiring us again this year and we can’t wait until next year! June 3rd was a day of firsts. Bella, our assistant face painter was hired for a gig in Lakewood on her very own with no supervision from John or Ana! She did FANTASTIC and has been asked back for future events! Additionally, Kadin, another assistant, did her very first professional cotton candy gig in Woodinville and was AMAZING! The kids loved her personality, she was efficient and even offered mixed cotton candy cone flavors! Finally, John did his first large decor job (many balloon columns, balloon arch, a lot of centerpieces, plus he had to do our Big Three package for the kids once the party started) and he did a great job! He says he will definitely allow more time for himself next time, since he was crunched for time during this gig, but it all worked out beautifully! Luckily, this party was at the Talon Grill in Lacey, so he didn’t have to travel far at all. June 4th was another busy day. 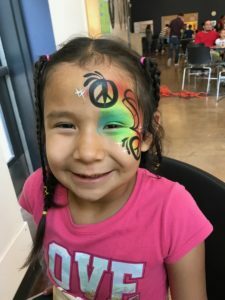 Ana did her annual face painting gig at the Duvall Fire Station. It was three hours of fast face painting as there are always tons of kids and adults waiting to receive some beautiful art on their faces. That fundraiser is one of the most successful events we have ever seen. Good on the neighborhood of Duvall for supporting one another! … John had a few gigs on the 4th; one in Olympia, and two in DuPont, which brings to light yet another fantastic fundraiser that went on! John did some charity face painting at Chloe Clark Elementary for a little girl named Savannah who is battling Leukemia. Boy, did ALL of DuPont come out to support her Spaghetti Dinner Fundraiser? It seems like it. They had so many people they ran out of spaghetti! Thank you to all who volunteered and made it a great success!